Woven through the rugged alpine environment, crossing creeks and diving with the slopes of North Star Mountain, Trickle Creek Golf course is one of the most thrilling British Columbia golf courses you’ll ever play. Located in beautiful Kimberley, British Columbia, and designed by renowned architect Les Furber, the course was recently awarded a bronze medal by readers of SCORE Golf Magazine for being one of the top resort courses in all of Canada. 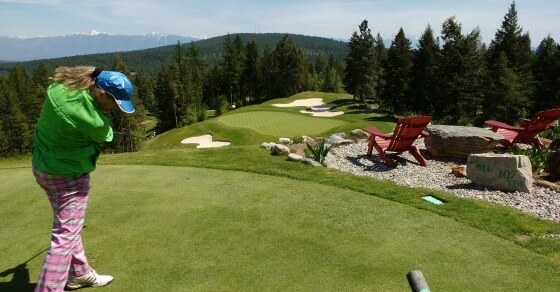 The 4½ star Trickle Creek Lodge is only a 3 wood away from the 18th tee. This premiere resort hotel is the ideal venue from which to base your golf or family vacation. Whether it’s great dining, relaxing on your private balcony or a trip to the outdoor pool and hot tubs, the Lodge offers the perfect conclusion to one of Canada’s finest mountain golf experiences. All guests staying at the Trickle Creek Lodge receive priority access to preferred tee times at the Trickle Creek Golf Resort.